YOUR INTENSIVE CARE HOTLINE - My 39 year old brother had a TBI! Now he’s back to Intensive Care with hydrocephalus and he needs a VP-shunt! Is this the best option? This question from Lisa formed part of an email counselling and consulting session with me. my 39 year old brother was in a motorcycle accident on 12/28/15 and he suffered a severe TBI(Traumatic brain injury). He was in ICU for several weeks on a ventilator and in an induced coma and he never fully recovered! He went to rehab too soon and then ended up in a nursing home out of town, because I think he didn’t have enough time in rehab. I got him in a nursing home closer to home about 4 weeks ago. On Monday 4/28 the nursing home called to inform me he had fallen out of his bed landing on the right frontal lobe which caused another brain bleed. He is now once back again in Intensive Care pending a VP- Shunt… What do I do? VP- Shunt =is a surgical procedure that primarily treats a condition called hydrocephalus caused by excess cerebrospinal fluid (CSF). His level of care was full assist due to the TBI(Traumatic brain injury) not to mention he had several broken bones that were not treated initially. He is paralyzed on the left side but is starting to move his left leg. I have seen a significant change in his speech in the past three days before he had the fall and his speech had improved significantly. They are now telling me he has a hydrocephalus(=fluid accumulation in the brain), so to avoid any further complications a VP-shunt would be the best option. Can you let me know if this is accurate? thank you for making contact and thank you for using my 1:1 counselling and consulting service! I’m very sorry to hear what you and your brother are going through! It sounds like this is a difficult situation. It’s very sad to hear that your brother needs full nursing care in a nursing home at such a young age. It’s also sad and concerning to hear that your brother had a fall on his head that caused another brain bleed. It makes me wonder if your brother is being cared for in the right facility if they can’t maintain his safety given that he’s fallen out of bed. You may have to look at other options down the line, including home care, if possible at all? Especially with a previous brain injury, the nursing home should have put strategies in place to avoid your brother falling out of bed in the first place! A VP- shunt will most likely reduce the pressure in his brain by having a device that can easily drain excess fluids in the brain. I have seen VP-shunts to be very effective in TBI’s and/or brain tumour Patients. Therefore it sounds like this is the way forward. What concerns me though is that he had a fall in the nursing home and it also concerns me that he wasn’t given enough time in rehab. Head and brain injuries or TBI’s take a very long time and sometimes it can take many weeks and many months to get to the best possible recovery and functionality. It breaks my heart to hear that your brother is now in a nursing home and that’s the best that can be done for him. Specialised Neuro rehab would be of utmost importance for your brother to get back to the best quality of life and functionality there is. Maybe there is another chance for him to get back to rehab after he’s had the VP-shunt inserted. It’s good news that your brother is starting to move his left leg and it’s good news that you could see improvements in his speech before he had the fall! One of the biggest challenges that I have experienced with head and brain injuries(TBI’s) is that often people are not given enough time to recover! 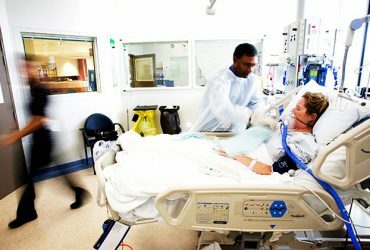 Critically ill Patients with TBI’s and severe head and brain injuries in Intensive Care are often labelled as “not having any quality of life” if they do survive and Intensive Care teams can often be overtly negative in those situations. They often do this for their own self interest because they don’t want to invest the financial, equipment, staffing and also emotional resources to improve TBI Patients’ lives and maximise their chances to survive and have some quality of life. It’s easier and also often cheaper for Intensive Care teams to either “sell” you and your family on a “withdrawal of treatment” or to “push” Patients out to rehab without giving them the best treatment in Intensive Care first. Nobody should ever make a judgement of what ones quality of life might look like after a stay in Intensive Care. It needs to up to the individual and not to Intensive Care teams who don’t really know what’s happening after a stay in Intensive Care! My experience has shown me that the more time and nurturing critically ill Patients with head and brain injuries/ TBI’s are given in Intensive Care, the better their chances are to recover! Again, many Intensive Care Units are not prepared to invest the financial, staffing, equipment as well as emotional resources that are necessary to get the best possible outcomes for their Patients! In your brother’s case, I would suggest that the VP-shunt is the best way forward as he then should be in a position to have excess fluids drained from his brain at any given time, therefore his neurological condition, including leg movements, speech etc… should improve. There is a very good chance that your brother will have a better quality of life with a VP-shunt! A VP-shunt can prevent a hydrocephalus! A VP-shunt can also prevent seizures, because a hydrocephalus can cause increased pressure in the brain causing some seizures. After his stay in Intensive Care, maybe your brother can have another shot at rehabilitation rather than going back to a nursing home and I don’t know if home care might be a better option for your brother if possible at all? I hope that this will work out for you and your brother! Please let me know if you have any questions or if you need further clarification. My Dad is in ICU after a SUBDURAL HAEMATOMA, he’s had MULTIPLE SURGERIES and he’s NOT WAKING UP! Help!”(PART 1) My 54 year old husband went into cardiac arrest and he sustained an anoxic brain injury! At first he wasn’t “waking up” but now he’s improving, what is next? My mother went into cardiac arrest after a heart attack! She’s been in ICU for 1 week, has brain damage and is not “waking up”, what should we do? My Partner is in Intensive Care after MVA with a head injury and he’s not waking up after 3 weeks! (PART 1) – INTENSIVE CARE HOTLINE My 29 year old husband is in Intensive Care with a brain injury and fractured legs! He’s been in an induced coma for four weeks and he has been septic! Will he be OK?